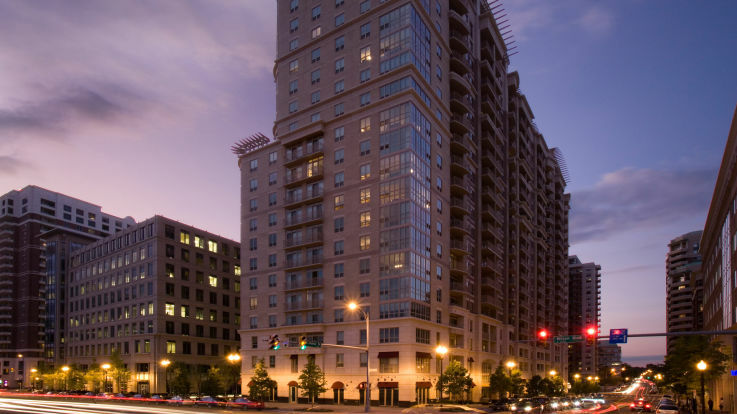 Located at the western end of Arlington’s Rosslyn-Ballston Corridor, our Ballston apartments right in between Northern Virginia and Washington, D.C. Developed as a streetcar suburb in 1896 after the Washington, Arlington, and Falls Church Electric Railroad was constructed along what is currently known as Fairfax Drive, the Ballston area is rich with historic buildings and a storied past. Once the Metro station opened in 1979, the area bloomed into a thriving retail, office, and residential center. Living in luxurious the Ballston apartments puts you within walking distance of the Ballston Metro Station and the Orange Line of the Metro. The Orange Line connects with downtown D.C. and Georgetown, and is one of the most scenic lines to take. Ballston has an urban atmosphere that balances pedestrian-friendly and car-friendly areas with a seamless integration of transit preferences. The Ballston-Virginia Square Walkabout, flanked by George Mason University, the Arlington Arts Center, and Quincy Park, is a perfect place to enjoy a little meditation in the parks, a trip to the Central Library, Welburn Square, and the tropical atrium of the National Science Foundation. Our Ballston apartments are close to the Kettler Capitals Iceplex, home of the Caps training facility. If you love to skate, play broomball, or hockey, the Iceplex is open for your pleasure during the week. Ballston’s Farmers Market is located on Welburn Square at 901 North Taylor Street, and is open every Thursday from 3-7pm. Just across the street from the Metro Station, the market is a natural gathering place for the residents of Ballston as well as the commuters coming home from work. With offerings of goat’s milk, cheeses, tree and field fruits, vegetables, honey, eggs, meats, flowers, and breads, the Farmers Market is a healthy alternative for locally-sourced goods that support the larger community. With weekly chef demonstrations and live music, it is an event for everyone to enjoy and participate. With such a vibrant community in which to live, work, and play, choosing to live in Ballston apartments will satisfy even the most discerning resident. Our communities can feature large living spaces, air conditioning, private patios and balconies, fully equipped kitchens, fitness centers, and heated outdoor pools. These pet-friendly communities also offer a close proximity to Capital Bikeshare and are extremely close to public transportation, fine dining, and excellent shopping opportunities. No matter what you’re searching for, you will be sure to find it with Equity’s Ballston apartments!